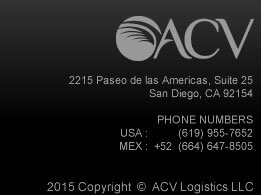 ACV is a growing company that provides Comprehensive Logistics Services with solutions in Transportation, Import-Export and International Relocation to the industrial, commercial, and residential segments in Mexico and the United States. Currently, we have offices in Tijuana, BC, La Paz and Los Cabos, BCS, and San Diego, CA. ACV has specialized units to transport your cargo safely and under controlled stability or temperature conditions. One of our friendly professional shipment specialists will contact you immediately to let you know how we can help you.